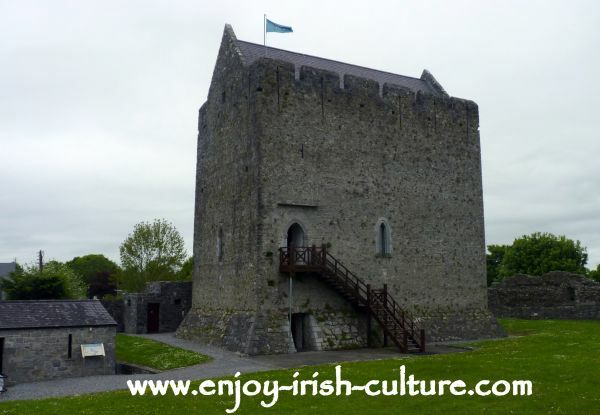 How were the medieval castles of Ireland built? Find out some fascinating facts on this page. The Normans had brought the techniques of building cut-stone castles to Ireland in the 12th century, and initially building works were carried out by Norman craftsmen. But the Irish were catching on fast. During the construction of Athenry Castle in Galway (seen above) for example, Norman craftsmen worked together with Irish stonemasons on the construction of the first phase of the castle. The build started as early as 1235. Working alongside the Normans, the Irish picked up the skills and techniques. That's how the building of cut-stone castles spread around the whole country within a generation of the Normans arriving. The Walls were built from cut stone. When you think about the amount of cut stone work that is involved in building a castle you quickly come to realize that it must have taken an army of stonemasons to carry out the work. And it was all done by hand. The stone masons pre-marked rocks at the quarry and designated them for different jobs, depending on their quality. The rock was then carted to the building site. A huge scaffold made of wooden beams was erected around the outside of the structure to help with the construction of the walls. 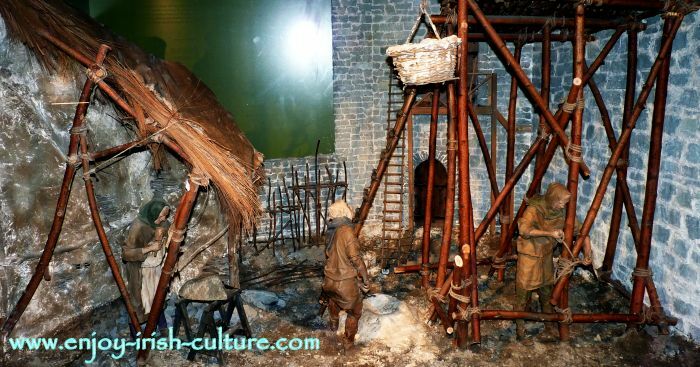 Here on the next photo is a model of such a scaffold as seen at the museum at King John's Castle, Limerick, Ireland. Using Mortar Or Not? Not all castles were mortared. Some were built in the dry stone method. But using mortar had certain advantages. Using mortar meant you didn't have to be as precise when cutting the rocks to get a good fit. It also meant that the castle walls were sealed much better. So eventually, building with mortar won out. Medieval mortar was lime based and contained all kinds of ingredients we wouldn’t dream of using today such as straw, animal hair, and even animal blood. In some castles, you can still see these when you look closely at the walls. This is the ruin of Ballykine Castle at Clonbur in County Galway showing lovely precise stone work. The Outside Finish? The photo below shows Cargin Castle in County Galway. Does the whitewash look odd to you? Well, actually, in medieval times, all tower houses were plastered with a lime plaster on top of the cut stone work, and then whitewashed. 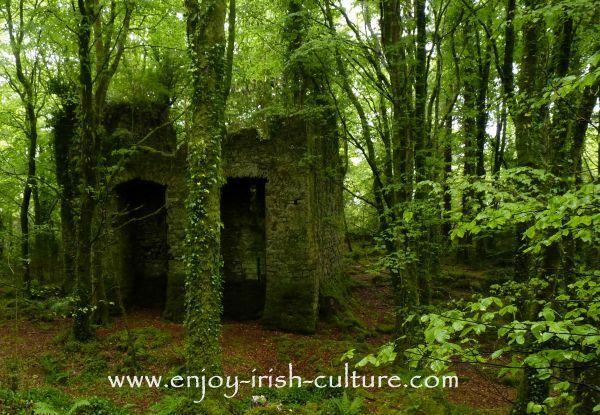 In medieval times, there was very little forest cover in Ireland which would have made these castles very visible from a long distance away. There was purpose behind the idea of using whitewash. Firstly, the appearance of your castle was meant to be off-putting. 'Don't come near me or I will bite.' was the message. 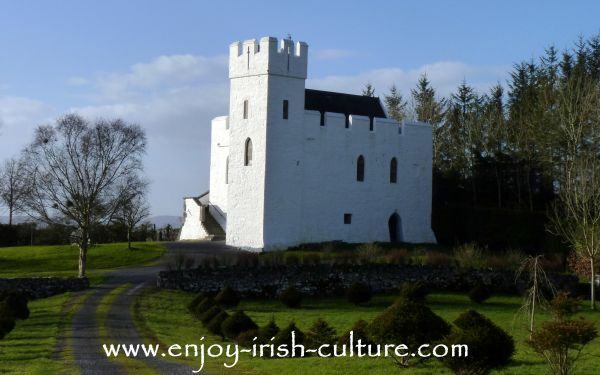 Often, the whitewash of Irish castles would be stained with pigments available locally, for example pink or yellow. These were warning colours, alerting passers by to stay away. And secondly, whitewash was functional, protecting your structure from water. 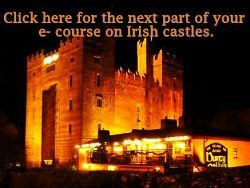 A medieval traveller in the 16th century once described the castles of Ireland as ‘emerging from the landscape like dragon’s teeth’. Looking at Cargin Castle above, and at Ballindooley Castle on the left with the traditional lime plaster finish, you will get the idea. You might think that roofs were covered in slate, and you might be forgiven for that...no they were not. To our surprise we discovered that a lot of castles were actually covered in thatch! How do we know that? 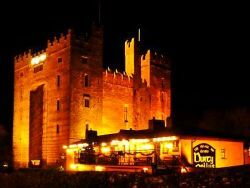 There is some recorded history to this effect, for example the history of a siege of Claregalway Castle in County Galway in the early 1570ies, during which the defenders of the castle uncovered all the roofs in the bawn as well as that of the keep so that they could not be set on fire. Only thatch can be set on fire easily! 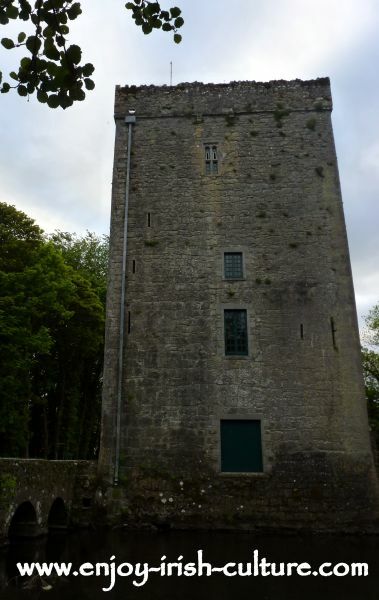 How Did The Doors Function In The Medieval Castles Of Ireland? 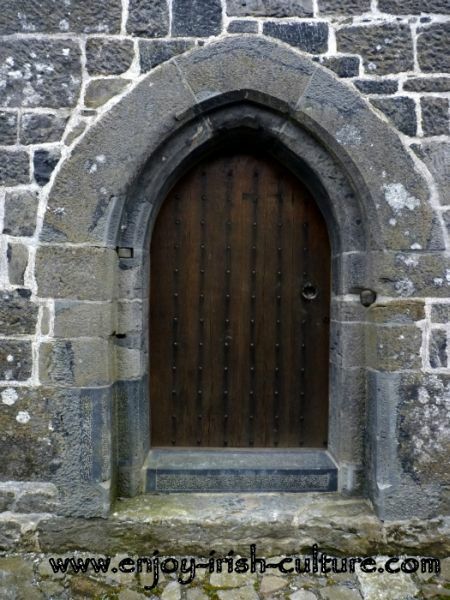 Before the days of precision metal work there were other creative solutions to create hinges: Castle doors, like the one above at Annaghdown Castle in Galway, often turned with the aid of round stones mounted in the door jamb, a ‘spud stone’ at floor level and a ‘hanging eye’ at the top. Many castle ruins will still show hollows in the stones in and around the door jambs. Look out for them on your next castle visit! The Garderobe- ah, what a lovely French term...no, not a for a warderobe as you might think...but rather for what would have been a rather smelly affair- the medieval toilet at the castles of Ireland. The castle featured a small room with a wooden board with a hole in it, at the right height to sit on and do what you had to do through the hole. 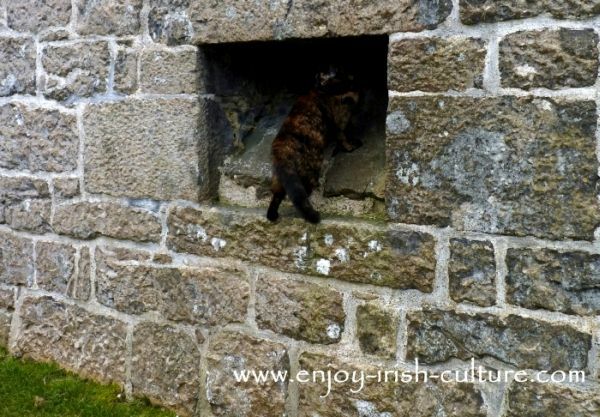 The hole opened either a short distance away from the castle wall to let your 'product' fall down (see it here at Athenry Castle), or, the business was led down a chute inside the castle wall to emerge lower down like in Annaghdown on the picture above where Scarlett the cat is taking a good sniff up the chute and at Yeats Tower (once the famous poets' summer residence) in the next photo where you can barely guess the gap on the bottom left of the castle's foundation that opens into the river. Many castles were built right next to rivers or lakes like in this example. The water would wash away the mess while also providing drinking water- medieval minds were not too bothered with the modern concept of hygiene. These days, all these places have modern toilets, of course. Building these chutes was a pretty skillful job that involved a lot of planning and precision stone masonry work. Imagine if there was a leak...I don't think the owners would have been too pleased. How Do You Build A Stone Vault? Stone vaults are architecturally very strong. They can carry large loads. Stone vaults were ideal for the ground floors of many of these medieval castles of Ireland. 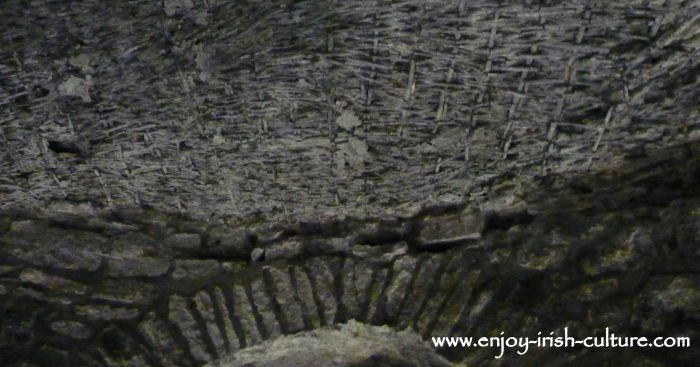 This image shows the stone vault on the ground floor at Craggaunowen Castle in County Clare. 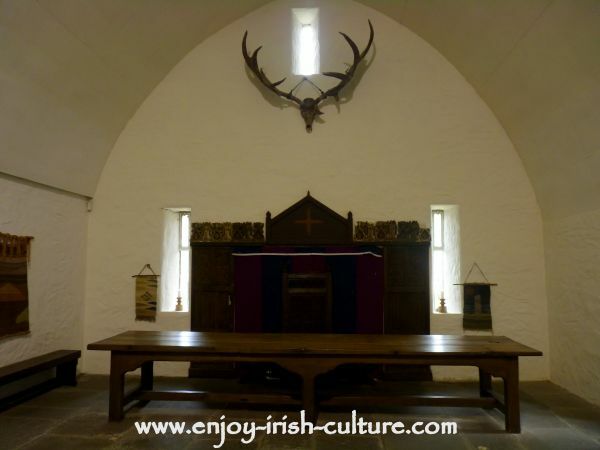 See another example of a vault at Athenry here. But how do you build a medieval stone vault? You need a structure underneath to support the vault during construction. In medieval times, they used a timber structure padded with wattle or wickerwork frames underneath the vault. The vault was built on top of that, and once the mortar had dried, the structural timbers could be removed. The wicker frames were often plastered over. See traces of this process in the ceiling of a vaulted room at Kilkenny Castle. Another example for the astounding precision in stone work in the medieval castles of Ireland are the custom made spiral staircases, a key feature in a lot of the castles of Ireland. Each step was carved from an individual block of stone. 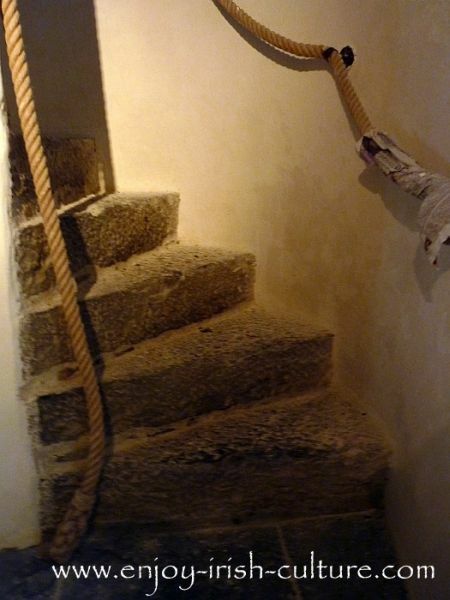 The staircase was built to suit the owner. 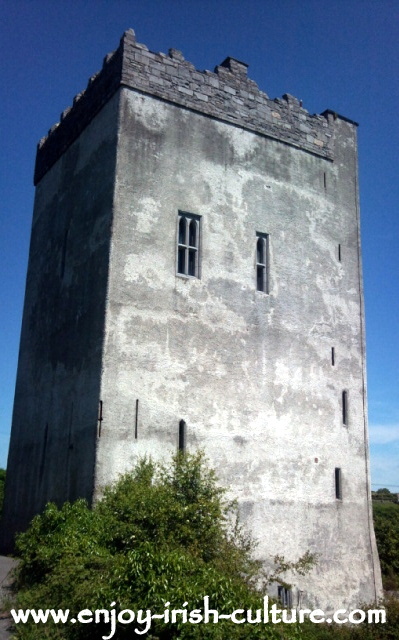 This one at Annaghdown Castle is left-handed, meaning the owner could easily defend it by sword from the top, holding the sword in his left hand. See a wooden stairway here at Parke's Castle. The ground floor of the tower house castles of Ireland had stamped earth or perhaps a stone finish depending on the use. Sometimes, (Annaghdown) believe it or not, cattle were housed here, in which case earth was sufficient. The upper floors had wood flooring, very wide planks cut from quality trees that were supported by huge oak beams. Please let us know in a comment underneath how you are enjoying this page!